Even though it may seem like a small detail, your baseboard trim, or the trim that goes along the bottom of the wall right next to the floor, can subtly change the look and feel of a room or an entire house. The right trim depends on a number of factors, including your home's style, other design elements in the room, the material you choose, and your budget. Baseboards come in a wide array of profiles, or shapes, and many manufacturers make dozens of different options. Typically, these profiles don't have set names but instead go by the dimensions of the product. Each is suited to a particular style of home. At your local home store, you'll find a wide selection of trim profiles, but the following options are the most popular with homeowners and builders. 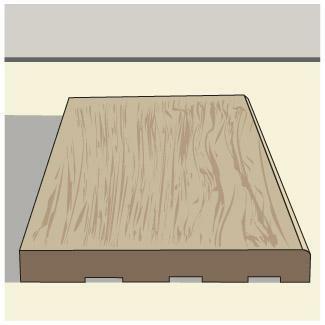 Rounded or stepped trim is probably the most common type of baseboard you'll encounter. This is the type of trim used in a lot of newer construction. Basically, it's a piece that's about 5/8 inch to 7/8 inch wide and three to three and a half inches tall. The top of the trim has a gently rounded shape or subtly stepped shape, allowing it to taper into the wall. Price will vary depending on the material of the trim and the store; however, this is one of the least expensive options you will find. Expect to spend about $1.60 per foot for this profile in oak. This trim style is best for a more modern home. Because of its relatively short profile and simple shape, it would be out of place in many older houses. However, the simplicity makes it a great choice if you want the trim to recede into the background. This can be especially nice if you have elaborate crown molding or another feature you'd like to stand out. Another simple option is base molding that is completely flat on the front. This type comes in different heights, usually ranging from three and half inches to four and a half inches. The back of the trim is grooved to allow for flexing and to help in the installation. 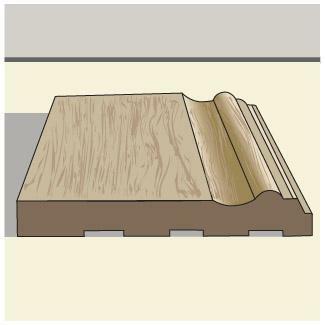 Most examples of this style of trim are about 5/8 inch thick; however, the thickness may vary depending on your application. Use this simple trim as it is or add a layer of a more decorative molding or quarter-round to give the baseboard a more elaborate look. This type of trim is priced similarly to rounded or stepped base molding, and it will vary significantly depending on the material. Flat base molding is actually more versatile than many other options. You can use it in almost any style of home, with or without crown molding or elaborate window and door casings. If you layer another trim on top of it, you can make it work well with architectural styles like Victorian, and it works great on its own in everything from Craftsman homes to contemporary houses. If you're hoping to pack more of a style punch, choosing a sculpted mid-height base molding is a good way to go. This type of trim typically ranges from about four to five and a half inches in height and is usually about 5/8 inch thick. The top portion of the trim is decoratively shaped, often involving scallops or steps that taper toward the wall. Because of the wide variation in the sculpting and height, this type of trim can range significantly in price. The material you choose will also make a significant difference in the per-foot cost of this style of trim. Sculpted mid-height base molding is best in houses that have a slightly more formal appearance than the typical builder home. This type of trim is a great way to add personality to any room. For instance, this would be the perfect choice for a formal dining room. It pairs well with any type of crown molding, but it's especially nice as the focal trim when painted or stained a contrasting color to the wall or floor. Taller baseboard molding is another option, providing the most significant visual statement. This type of molding can range from about five and a half to seven inches or taller. Often, the top edge of the trim is sculpted with scalloped or stepped details to provide visual interest and help it taper into the wall. The width can range from the standard 5/8 inch to as wide as an inch. This is typically the most expensive type of floor molding you can purchase, and the cost varies depending on the height, the shape, and the material. Often, taller trim is a great choice for homes that are large in scale. If you have high ceilings or large rooms, this trim can be ideal. It's also great if you have children or pets that might leave scuff marks along the lower portion of the wall, since it can help protect this vulnerable area. Keep in mind that this type of trim makes a style statement; you should avoid pairing it with elaborate crown moldings and other trim pieces if your house is on the simpler side. 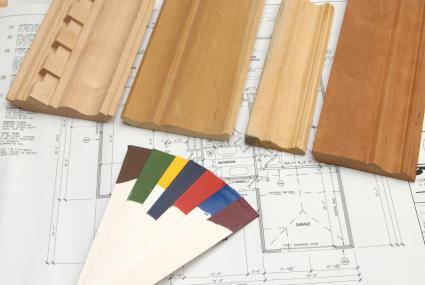 When it comes to appearance and cost, the material of the molding is every bit as important as the shape. Each material has its advantages and disadvantages, and the best one for you will depend on a number of factors in your home. A fairly recent development in the world of home improvement, MDF is made up of wood fibers, resin, and other materials. Manufacturers can easily sculpt it into a number of different shapes, and it comes primed and ready for painting. It's extremely easy to cut since its texture is more consistent that wood. If you're on a budget and are planning to paint your trim anyway, MDF can be a good choice. However, if you're looking for authenticity or you want to stain your trim to match your floor or the other molding in your house, you'll need to stick with wood. Another budget material, pine is an inexpensive softwood that makes a good choice for trim. It comes primed or unprimed, allowing you to paint or stain it to your liking. Most good quality pine molding will be free of knots or other blemishes, but it can be inconsistent to cut and may splinter. Before you buy a piece of pine molding, check it carefully for warping or cracks that could make part of all of the piece unusable. Pine makes for inexpensive trim, and it's a great choice if you'll be painting. Buy it primed if possible to give yourself a head start. If you won't be painting, pine lends a rustic charm to a room. Stained pine trim isn't the best choice if you're going for a more formal look. For a quality, elegant look, hardwood is an excellent choice. 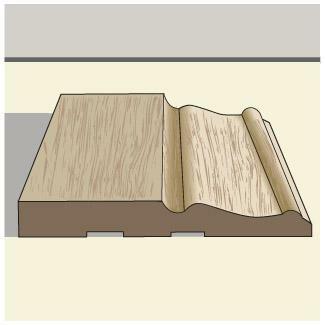 Oak is the most popular trim species, but you can find trim to match any wood in your home. 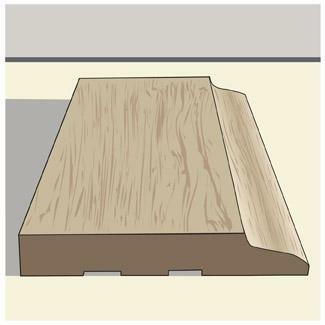 This is the priciest option for baseboard molding, and the cost will depend on the profile and the wood species. Always examine trim before buying it, since wood can be prone to warping. 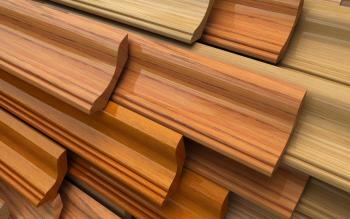 Hardwood is your best choice if you'll be staining the trim to match existing molding. It gives a high-end appearance to any home. You may have seen quarter-round molding layered in front of the taller baseboard trim in some houses. This can provide a nice finished look, and it's also great for solving some common problems. Quarter-round can fill the gap between where the flooring ends and where the wall begins, and with hardwood floors, this gap can be quite wide. Additionally, it can help to hide height differences caused by a wavy floor or wall. If you aren't faced with these problems, you may still choose to use quarter-round for its aesthetic appeal. This is largely a matter of personal preference, since quarter-round is simple and works with any style of home. Whether you choose to paint or stain your trim depends on your personal preference, the color of the molding already in your home, and the type of flooring you have. Consider several important factors before you decide. Painting or staining your trim in a contrasting color calls attention to the perimeter of the room. This can be attractive if your room has some pretty angles and is fairly large. Smaller rooms can look cramped if you draw the eye to the floor perimeter. You should always match the new baseboard molding to the existing window and door casings and any crown molding. Having baseboards that are a different color will give your home a patched-together appearance. White is the most popular color for painted trim. If you are planning to paint your trim, it's important to remember that white trim can show dirt easily. You may want to consider a high-gloss, easy-to-clean paint for this type of job. With all the styles and materials out there, the perfect baseboard trim is within reach. Do your homework and consider all the options before making a decision. You'll be amazed and the difference baseboard molding can make in the look of your home.